As we grow older, we tend to become control freaks. We need to control everybody and everything, moment by moment, to be happy. If the now has never been full or sufficient, we will always be grasping, even addictive or obsessive. If you're pushing yourself and others around you have not yet found the secret of happiness. It's okay as it is. This moment is as perfect as it can be. The saints called it the sacrament of the present moment. --Richard Rohr, Everything Belongs. It seems a ridiculous question. Of course I'm not God. But sometimes we act like we think we are God. As Richard Rohr says in the quote above, as we grow older, we tend to want to push ourselves and others around, judge, tell others what they should and shouldn't do. A counseling professor I had years ago called this "shoulding on people." We spout opinions about the way the world should be if we were in charge. We think we're all knowing because we have a phone and the internet. We take on much more responsibility for situations sometimes than we ought. It was helpful to me last week in a couple of situations to simple step back from getting emotionally involved in a problem at home or work and ask myself, "Am I God? Can I control this situation?" No. This is the stuff of AA or CR or the Serenity Prayer. "Lord, give me the serenity to accept the things I cannot change." Stop there. This means everyone around you. You can't change people around you. The prayer could helpfully add, "and people" to read, "Lord, give me the serenity to accept the things and people I cannot change," which is to say everyone around me. Sunday as I preached I asked the church to repeat, "I am not God." It felt good for some to release the pressure to carry burdens only God can carry for us. I am not God, and as such I do not control the world. I can cry or be pained for the world, lament war, famine, refugees, and do something about it by planning my life around helping the poor, the refugee, and bringing peace wherever I'm present, but I cannot ultimately change the world's situation or carry the burden of the world on my shoulders. I am not God. When people asked him (John 1:19-34) "Who are you?" he first said who he is not. "I am not the Messiah. I am not Elijah." Then who are you, John? "I am a voice crying in the wilderness, Repent! I'm preparing the pathway for the Messiah." "He must become greater. I must become less." NPR's Morning Edition tells the story of Julio Diaz, a 31-year-old social worker from New York City who after work one night exited the subway onto a nearly empty platform. As the train left, a boy about twelve years old was standing near Diaz. The boy pulled a knife to threaten Diaz and asked for his money. Diaz gave the boy his wallet and the boy fled. Before he was too far away to hear, Diaz shouted at the boy and said "Wait! You forgot something. Here, take my coat." Diaz was taking off his coat when the boy stopped, turned around, and looked puzzled. "Are you crazy? Why are you doing this?" the boy asked. "Well, if you're willing to risk your freedom for a few dollars, then I guess you must really need the money. I mean, all I wanted to do was to get dinner. And, if you want to join me, you're more than welcome." The boy agreed to join Diaz. They walked to the diner and sat in a booth. Soon the waitress came by and asked Diaz if he'd have the usual. She chatted a few minutes before putting in the order. The manager came by the booth to say hello to Diaz and his young friend. The dishwasher came out to say hello. Watching all this, the boy asked, "Hey man, do you own this place?" "I just eat here a lot." "But you're even nice to the dishwasher." "Well, haven't you been taught that you should be nice to everybody?" Diaz asked the boy. "Yeah, but I didn't think people really acted that way," the boy said. The social worker in Diaz saw an opening. He asked the boy what he really wanted out of life. The boy's face was downcast, and he didn't have much of an answer. When the bill came, Diaz told the boy, "Look, I guess you're going to have to pay this bill for me, because you have my money, and I can't pay for it. But if you give my wallet back, I'll gladly treat you." The boy handed over the wallet. Diaz paid the bill, and then he pulled out a $20 bill, placed it on the table and pushed it across the table to the boy. "I know you could use this, but I want to ask you to give me something in return: your knife." The boy took the $20 and handed over his knife to Diaz. I don't know what Diaz's beliefs are, but he was living like a man who had a mantra like John the Baptist's: He must become greater. I must become less. My money must become less. My coat must become less. My time must become less. My own life must become less. The person right in front of me is Jesus, and Jesus must become greater. In Luke 3:10-14 people ask John the Baptist what they should do about the preaching by John about being fruitful, and fruitless trees getting cut down. The crowd asked, "What should we do?" John replied, "You have two shirts? Give one away." Tax collectors asked, "What should we do?" John: "Don't collect more than you should." Soldiers, "What should we do?" John: "Don't extort money and don't accuse people falsely--be content with your pay." 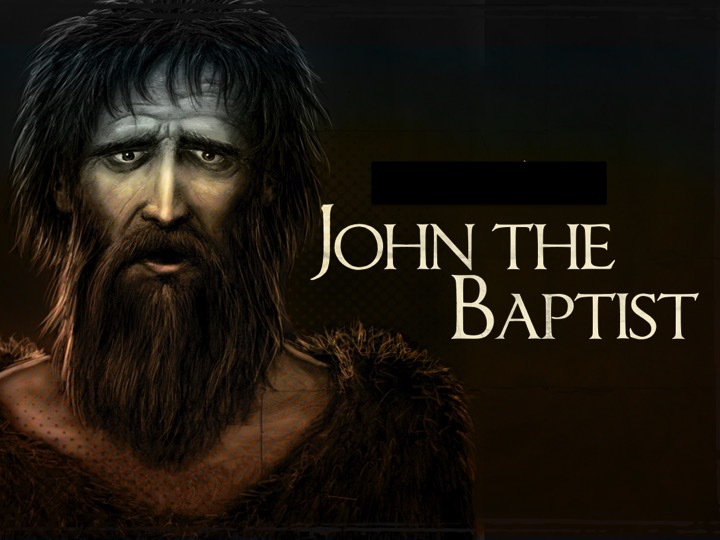 What would it be like to live the mantra of John the Baptist, "He must become greater. I must become less"? When my wife was pregnant with our first child, I gained some sympathy weight. I was also eating for two! I didn't need to gain more weight. Jill needed to gain weight, so I went on a diet and called it the "She must become greater, I must become less diet"! If I were to write the name Arthur Conan Doyle, would that mean anything to you? Of course you could google it, but without doing that, do you know who he is? And yet he created a character you most certainly know. He created a character bigger than himself as a writer. Stephen King is a name you know because he has sold millions of books. And probably in his day, people knew Doyle, but the character he created was so big it continues in our imaginations today and is recreated over and over in dramas and stories. The character's name is Sherlock Holmes. Living this mantra of John he Baptist is not easy or immediate. In fact, it's more like the process described in the song I heard as a teenager when an elder of the church I attended stood up and read all the stanzas in a monotone, but all these years later I remember it and asked our worship leader, Cory Legg, to lead the song in our worship. The song title is, "None of Self and All of Thee." But the four stanzas progress from early discipleship where the disciple proudly says, "All of self, and none of Thee." As life's trials come, the disciple says, "Some of self, and some of Thee," then later "Less of self, and more of Thee." Finally, humbly the disciple says, "None of self, and all of Thee." This is a lifetime of discipleship and step by step emptying of our selves as Jesus emptied himself (Philippians 2). A portion of the Prayer of St. Patrick strongly ties to this mantra of John the Baptist and the question, "Who is bigger when people think of you?" Christ be with me, Christ within me Christ behind me, Christ before me Christ beside me, Christ to win me Christ to comfort me and restore me. Christ beneath me, Christ above me Christ in quiet, Christ in danger Christ in hearts of all that love me Christ in mouth of friend or stranger. One version of the prayer says, "Christ in the mouth of everyone who speaks of me." Who is bigger? The mission team Jill and I served in Uganda with had a mantra first said by mentors at Harding University. "Do something bigger than yourself." What does it mean to live this mantra in each of our lives. For a ministry at our church that does media during our Sunday services, their mantra is "do not distract but point people to God." They want the microphones, sound, projection, video all to work without distracting from the point of it all: Jesus. This team of media volunteers want, as John the Baptist wanted, to point to Jesus. He must become greater. We must become less.